We hosted our 8th annual 4th of July party last week and each year it gets more and more fun! 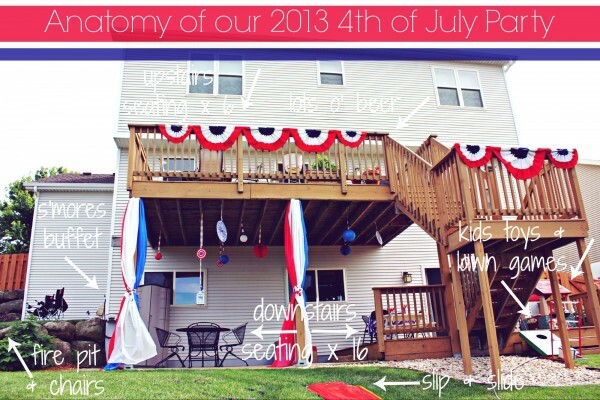 We schedule our party each year to coincide with our neighborhood fireworks show (we have an excellent view from our backyard!) and this year that fell on Tuesday, July 2nd. It was a bit of a bummer to have the party on a weeknight when most people have to work the next day, but despite our city’s inopportune timing we still had a great turnout! 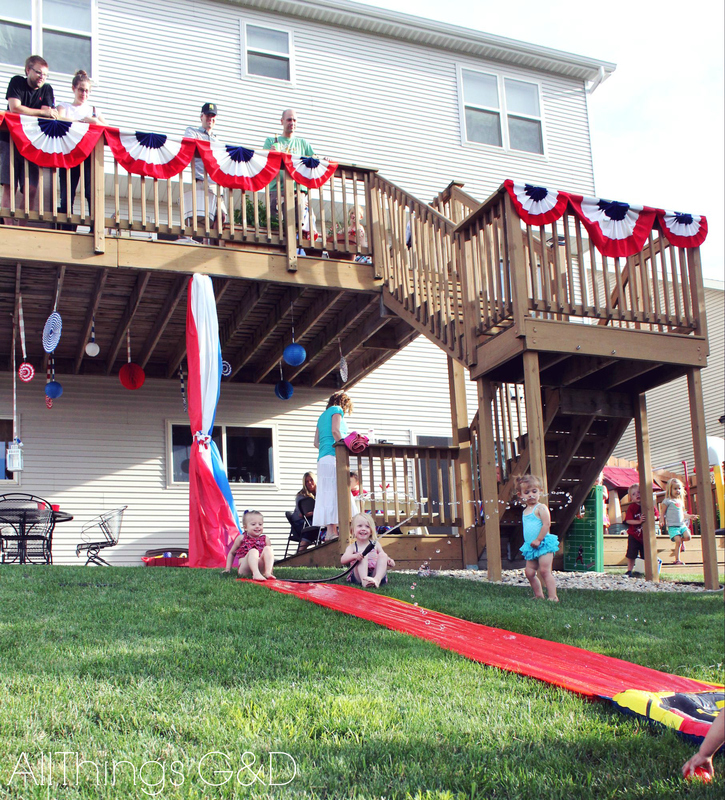 Nearly 60 of our friends showed up (36 adults and 22 kids) to join us in celebrating America’s birthday this year! Our backyard, all set up for a patriotic Fourth of July party! 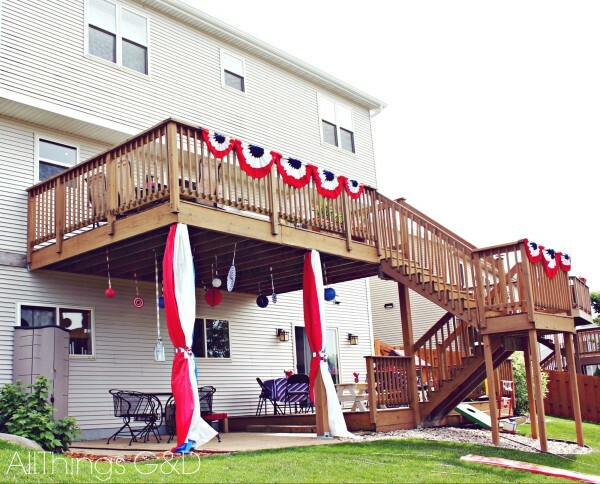 And here’s a closer look, starting with our lower deck and stone patio. 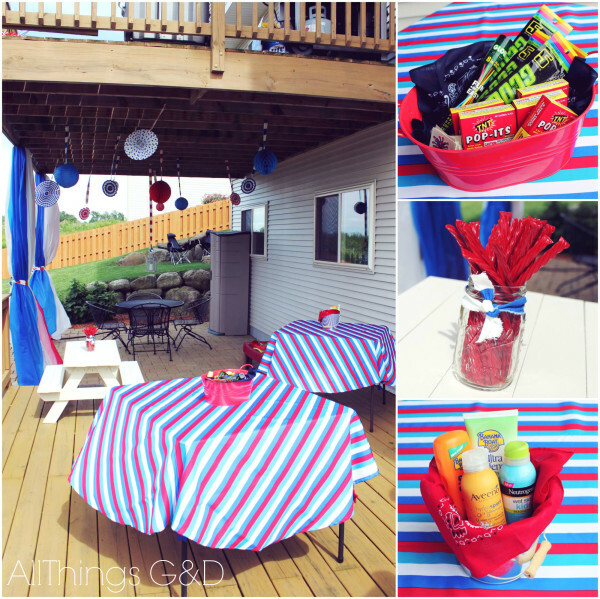 We set up card tables on our lower deck, draped in red, white and blue tablecloths (to distract from the fact that they’re card tables) and topped them with 4th of July party necessities like sunscreen, bug spray, pop-its, glow bracelets, and patriotic tattoos for the kiddos. 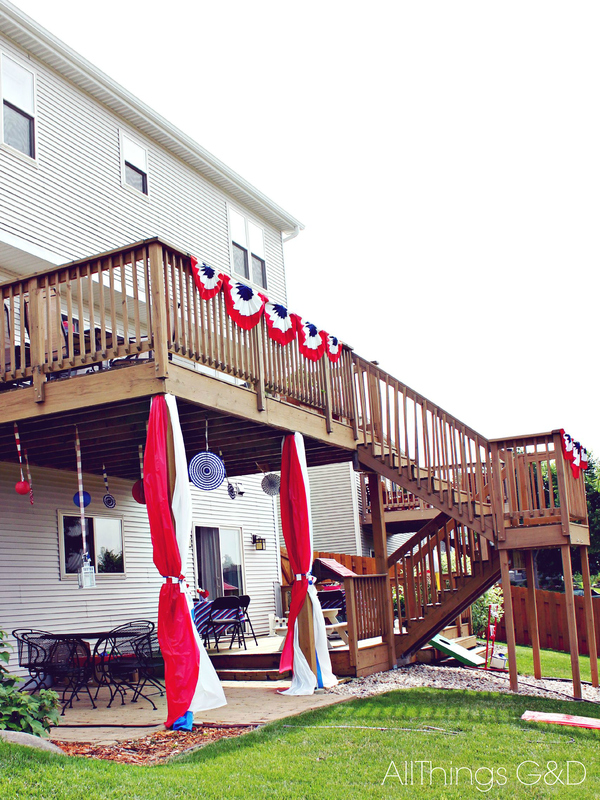 Our backyard, all decked out for a patriotic 4th of July celebration! 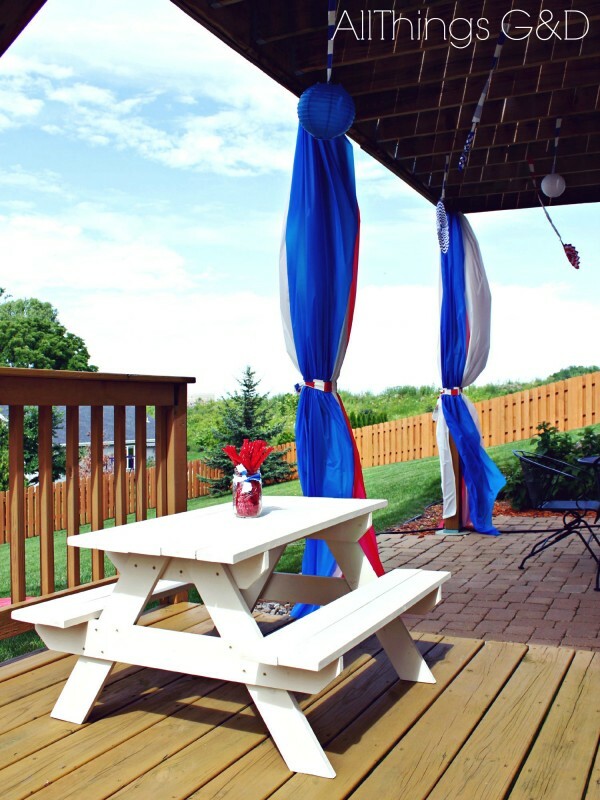 G made this adorable little children’s picnic table for Kate, just in time for our party. It was a popular spot for the little ones! I was trying to think of something fun, festive and popular with the kids to use as a centerpiece for the kids’ picnic table. 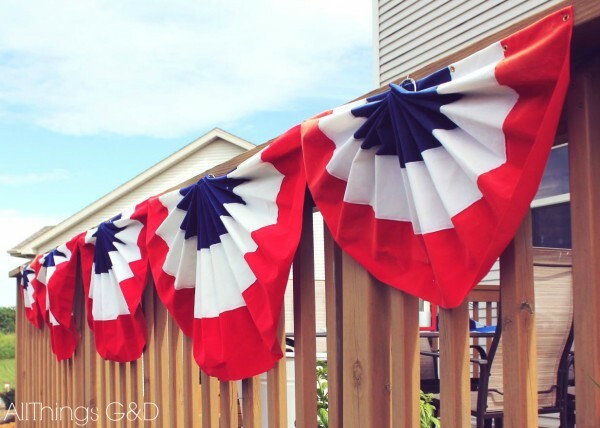 I originally had a cute little pail filled with American flags on sticks, but I couldn’t help but admit that 2 and 3 year olds might not get too excited about that. I’d bought a large bag of Twizzlers for the party to have on hand for snacking, and at the last minute realized they’d be perfect for this! 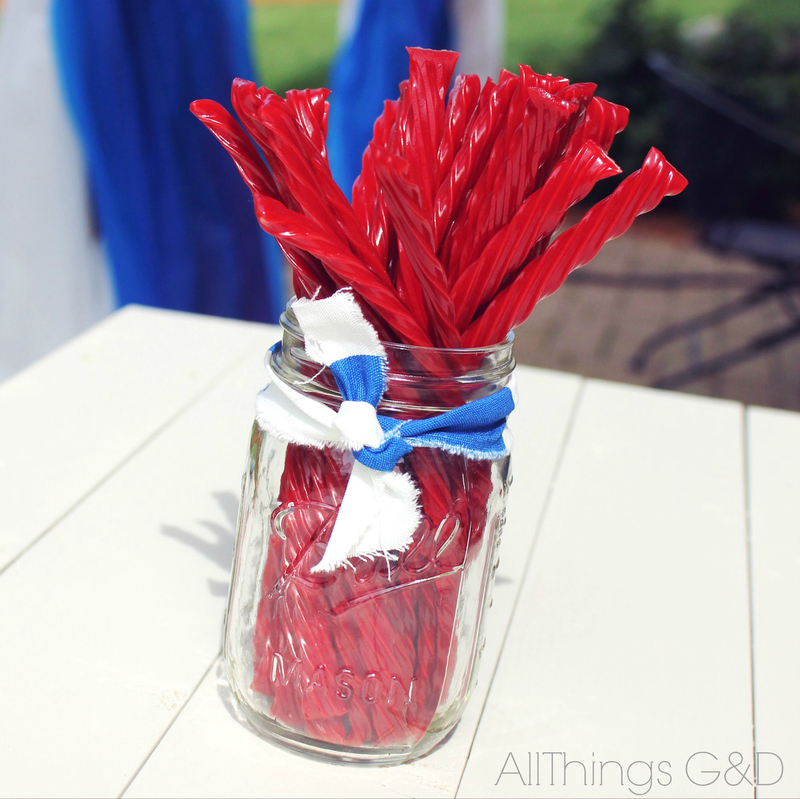 I grabbed a Ball jar, tied a scrap of fabric around the rim, and popped those Twizzlers in. Red, white, and blue – and fun for the little ones! 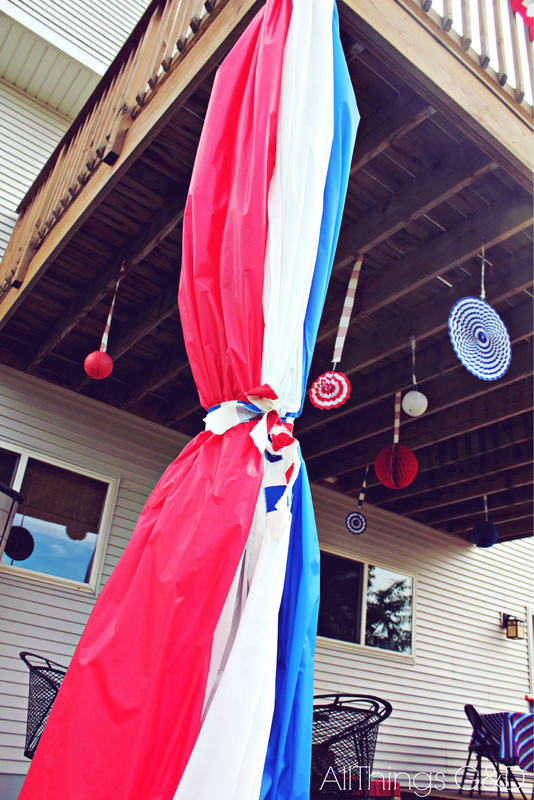 Again this year I hung red, white, and blue paper decorations over our patio from the ceiling of our upper deck. A new addition this year – I ripped up strips of red & white and blue & white striped fabric and used them to hang the paper decorations for some bolder pops of color. Each year I can’t help but notice that whatever I place as a centerpiece on this table (below) always gets removed and set on the ground. This year I decided to be one step ahead by hanging the centerpiece above the table. Guests could still enjoy the ambiance of the lantern, without it getting in the way of their food, drinks, or cards! 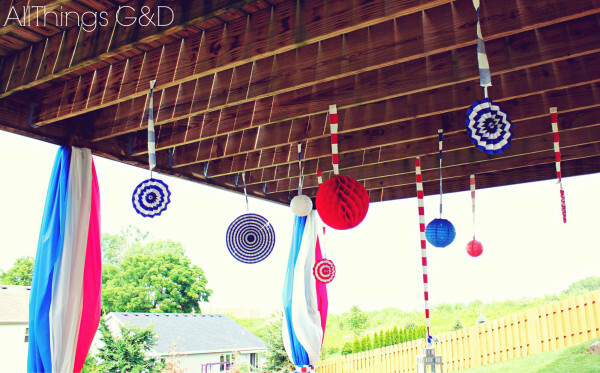 A hanging centerpiece to free up table space! 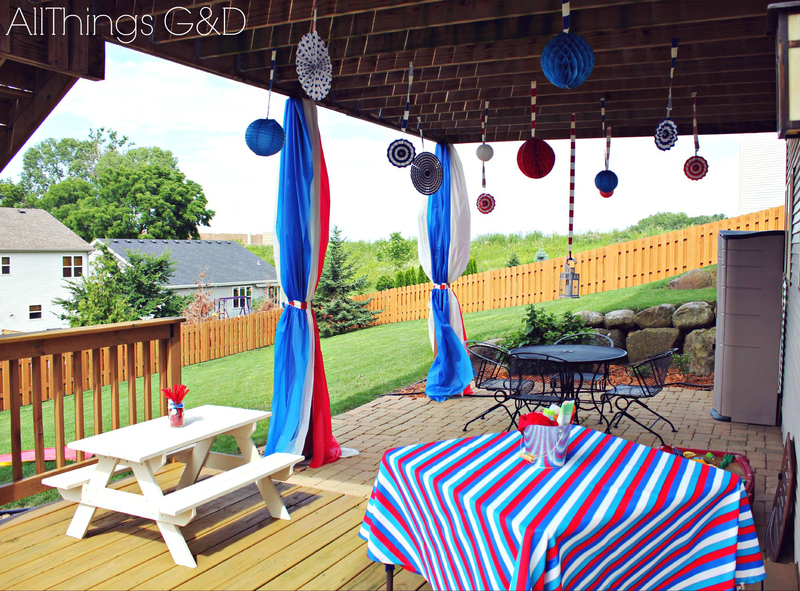 In looking for more ways to bring color to our outdoor space, I decided to decorate our deck posts! 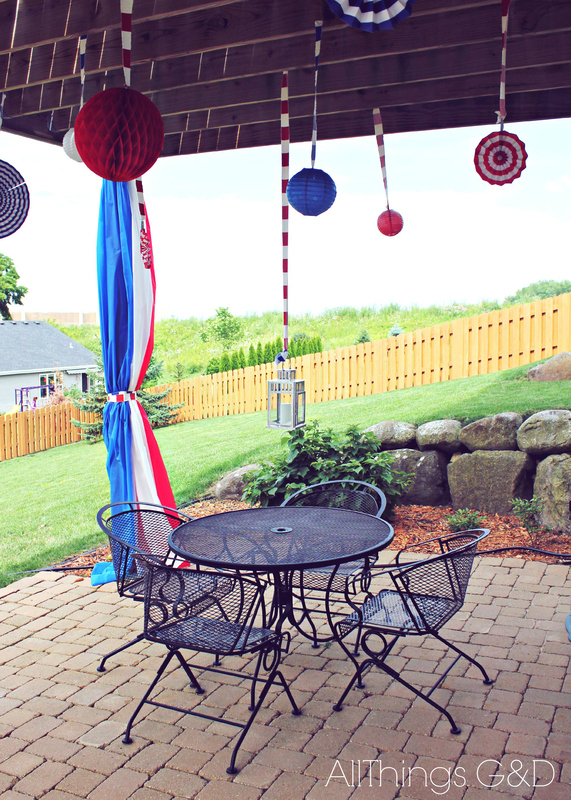 I’ve considered the idea of doing outdoor drapes down here, but our outdoor enjoyment season is so short in Wisconsin that it really wouldn’t be worth the investment. As I continued to brainstorm ways to dress up our posts without breaking the bank I noticed a roll of red plastic used for table covering sitting in a closet (leftover from Kate’s 3rd birthday party) and I knew it would do the trick! 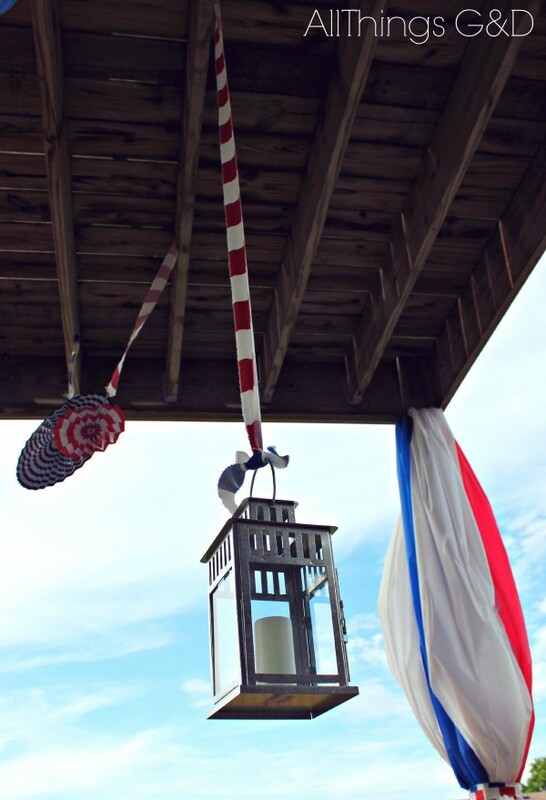 I bought a roll of white and a roll of blue, stapled them to the the top of the posts with a staple gun, and tied them with fabric strips to keep them under control in the windy weather. 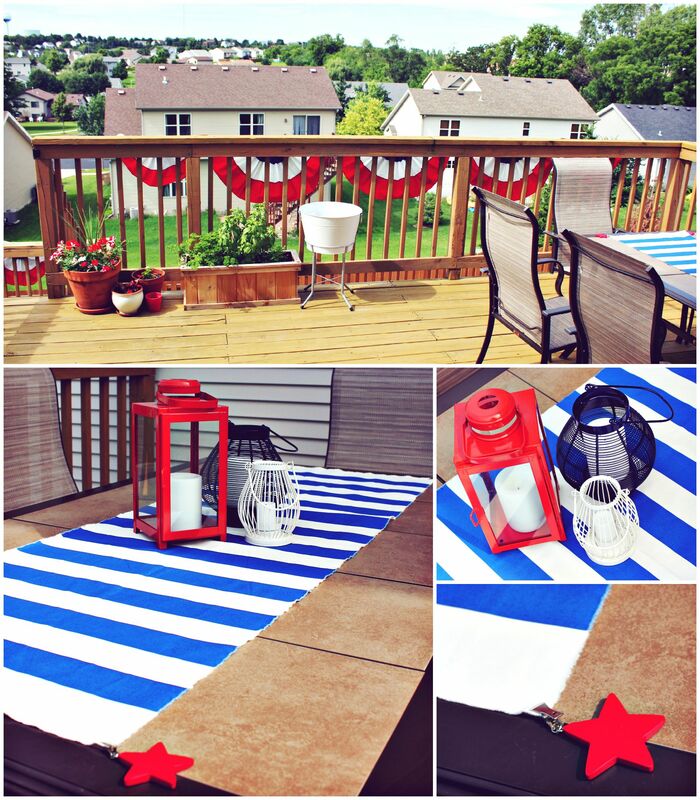 It was a cheap and easy way to have a high impact outdoors! Use rolls of plastic tablecloths for a cheap and easy way to add color and drama to your outdoor space! 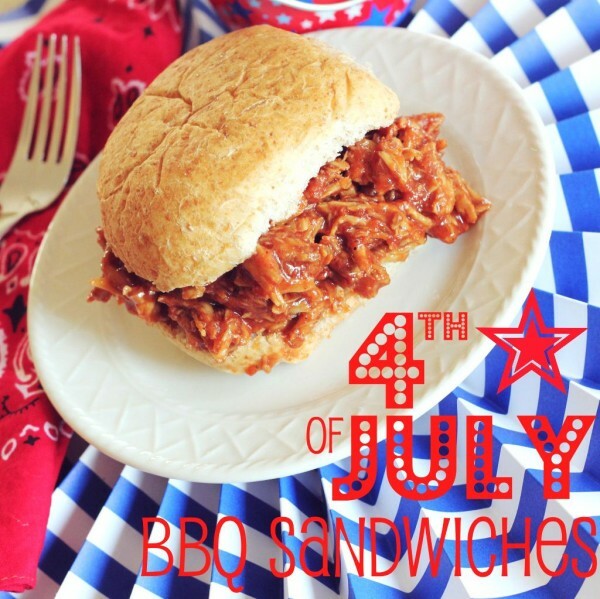 As always, I made our crowd-pleasing homemade BBQ pork sandwiches for this year’s party! Last year I roasted up a 10lb pork loin to make BBQ for 50 guests and the pan was scraped clean. This year I doubled the batch and was grateful to find we had plenty to feed our 58 guests with some left over for lunches and to freeze for enjoying later in the summer. 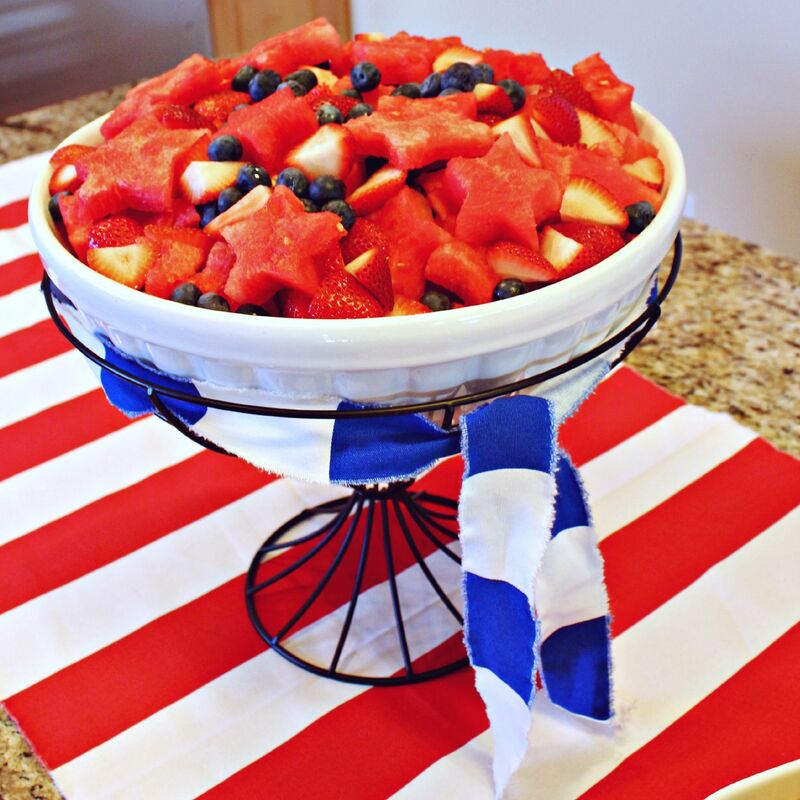 I couldn’t resist this cute and easy patriotic fruit salad idea I’ve seen all over Pinterest. I cut watermelon with star cookie cutters and added blueberries and slice strawberries. It was both festive and delicious! Last year I tried my hand at making homemade marshmallows for the first time, and they were a huge hit! 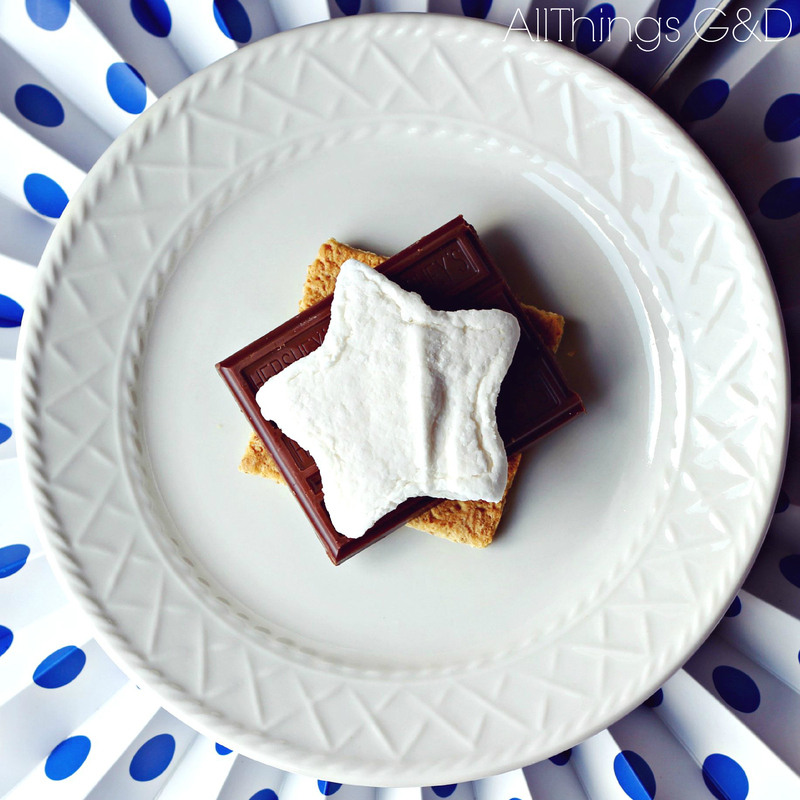 This year I was at it again, only instead of cutting them into traditional cubes, I decided to cut them into stars for some patriotic star marshmallow s’mores! 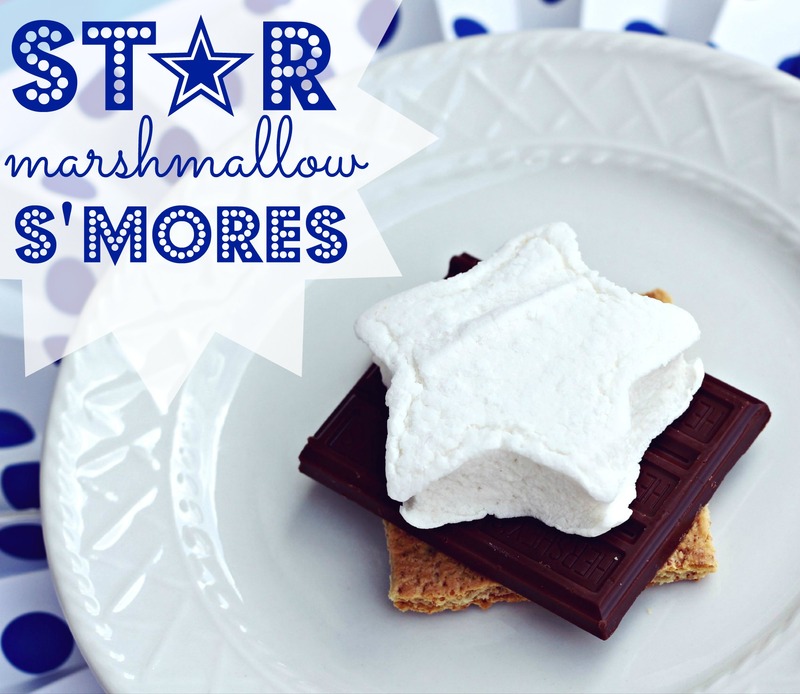 I used the “scraps” of my marshmallow cuttings to make a double batch of homemade s’mores bars. I made these last year for the first time because it was so hot outside I wanted to save my s’mores-loving guests from having to brave the firepit. This year the temps were much cooler (mid- to low-70s) but I had the ingredients to use up so I decided to make them again and I’m so glad I did! I had several guests tell me, “I’ve been waiting all year for your party to have these again!” I’ll have to remember that just like my homemade BBQ, these are now a must-have at our 4th of July parties! In addition to the few things I made, all of our guests brought things to share, which makes for such a delicious variety! 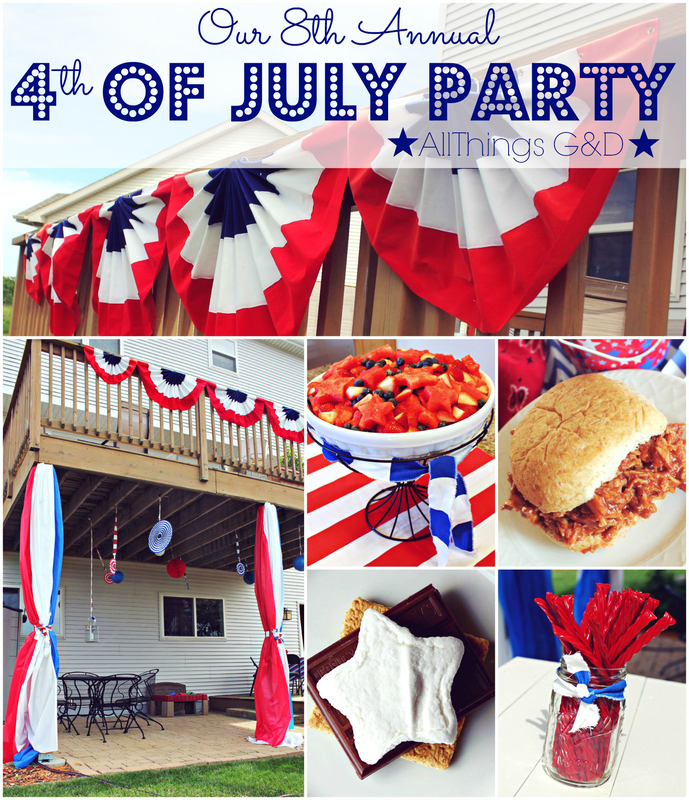 We had everything from pasta salads to guacamole and Mexican roll-ups to sugar cookies and artichoke dip and sangria. Getting to enjoy all the little food surprises our guests bring is one of the many things I enjoy about this annual celebration! 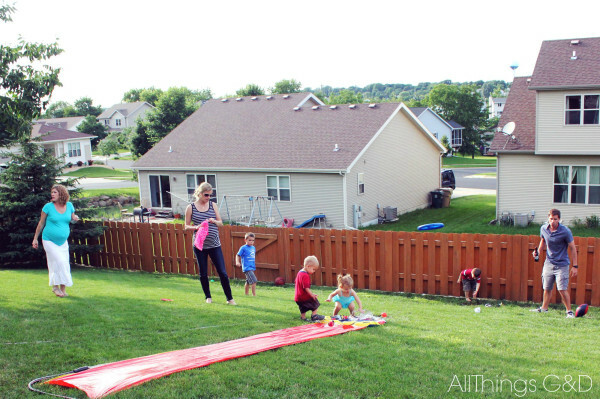 For the second year in a row we had a slip & slide set up, and even though our weather was slightly on the cooler side, kids still enjoyed getting their slide on! We had loads of other lawn and outdoor games out for guests to enjoy, including golf toss, bag toss, ring toss, croquet, frisbees, bubbles, and virtually every ball you can think of! 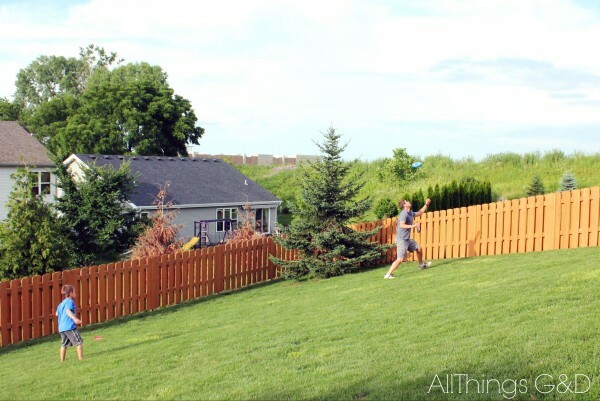 Sam (age 5) and his dad Doug, tossing the frisbee around in our backyard. 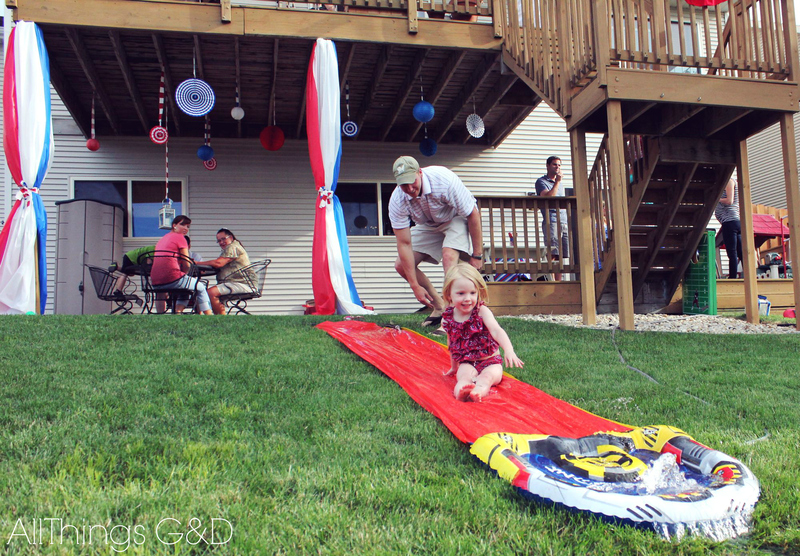 Kate (age 3) getting a push from Daddy down the slip & slide! Kate soaking up the slip & slide before Lily (age 3) and Adi (20 months) take their turns! Just like last year (and every year before it) I have a chance to snap pictures during the very beginning of the party before it gets super busy and fun and exciting, and then I set my camera down never to think of it again for the night. This unfortunately means I have a lack of party pictures with actual guests in them – but should really be interpreted as a sign of a good time! 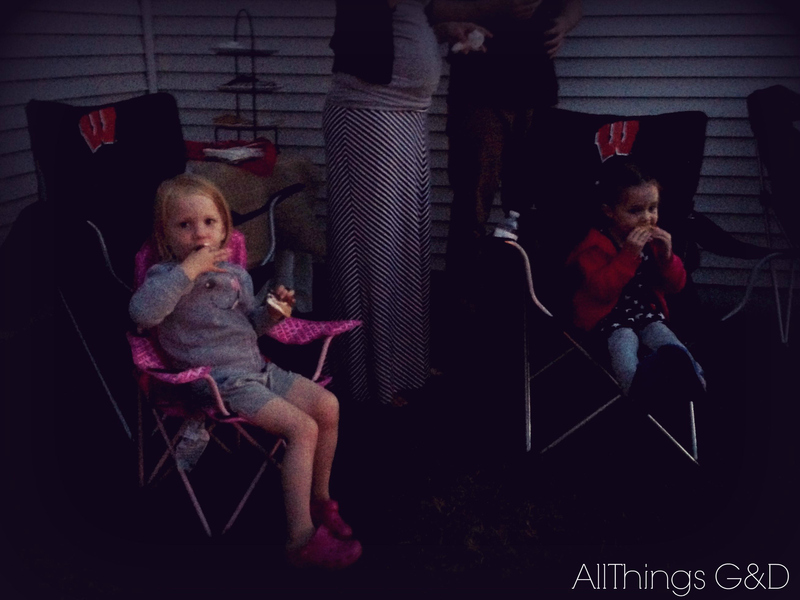 Kate and her BFF Gwen enjoying s’mores before the fireworks. Each year I mean to get pictures of our view of the fireworks, and each year I forget. (Next year!) This year I had the pleasure of enjoying our city’s fireworks show snuggling with my daughter on a blanket in our backyard surrounded by loved ones, while Kate and her friends clapped and cheered at the sights of fireworks exploding in their favorite colors. It was the perfect ending to a wonderful evening! I hope you all had a safe and happy Fourth of July celebration! You’re such a great hostess! Looks like it was a fabulous time! You sure know how to throw a party! I loved the recap. Love all the cute decorations! It all looks super cute. 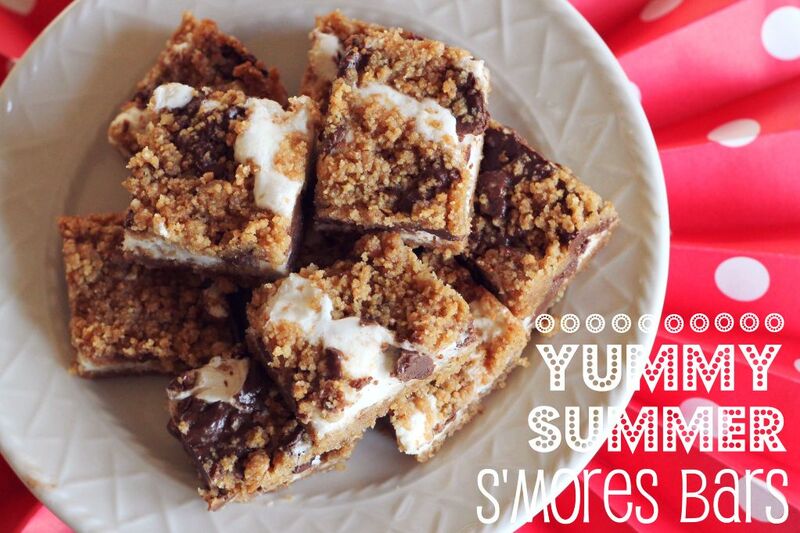 I want to try & make those homemade marshmallows & then the s’mores bars since anything s’mores is my favorite. 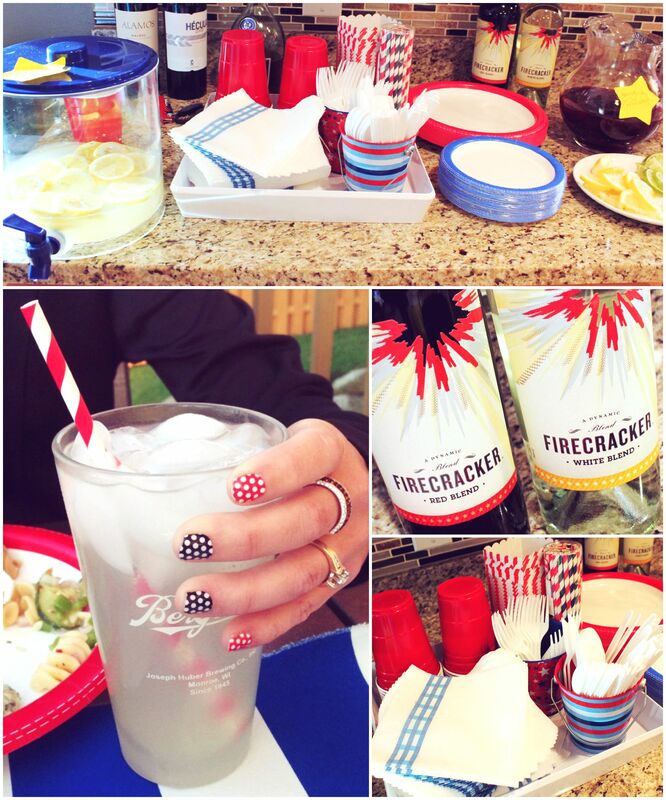 And love the patriotic nails whose ever those are! Thanks Tara! The super cute nails belonged to our party guest Keely – they were so adorable I couldn’t resist snagging a picture! The s’mores bars are always a huge hit – let me know if you make them! I literally just ate lunch and felt stuffed…until I saw all of that yummy food. Now I want s’mores but I probably shouldn’t light a bonfire in my office. LOL Jenn! Yeah, there may be some codes against that, although feel free to light up in the parking lot! Thank you so much for coming, Keeley!! Your nails were the hit of the party, girl!